London 1860, Uncoloured.. 238x188mm. In good condition decent size margins dark impression on stiff paper. TURNER, Francis Calcroft - Bachelor's Hall, plate 6. London, 1820, Coloured.. 300x350mm. The printed area is 300 x 350 mm the sheet is 375 x 520 mm. The condition of the printed area is good, with bright colours The margins are wide, the right hand margin is water stained well away from the printed area. Hand coloured aquatint engraving with etched linework on wove paper. 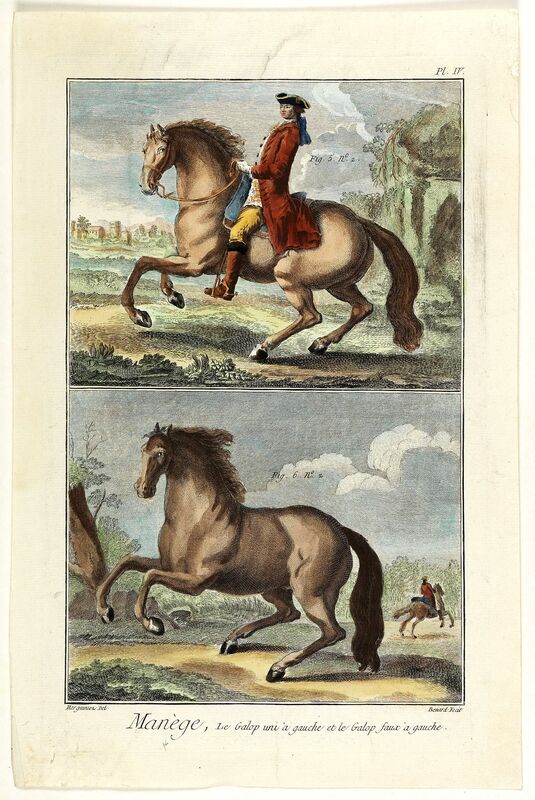 From a series of total 6 hunting plates, titled 'Bachelor's Hall', a humorous portrayal of bachelor fox hunters. London 1743, Uncoloured.. 370x235mm. In mint condition. 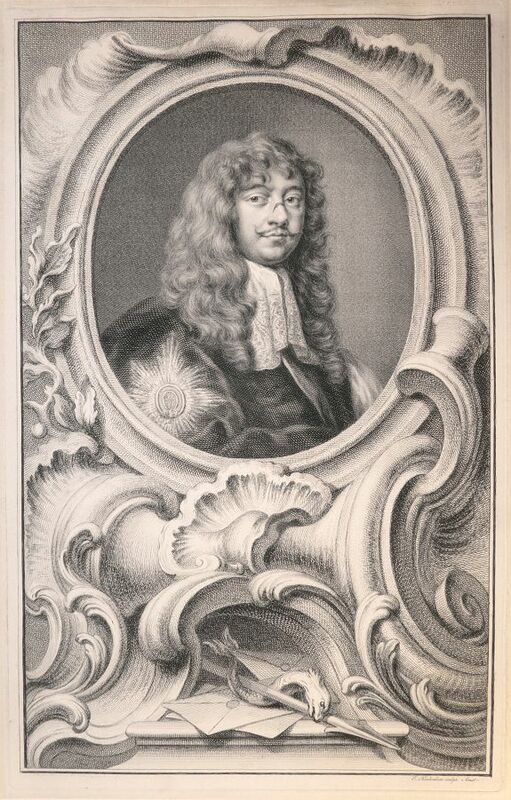 Engraving by Jacob Houbraken after Sir Peter Lely. 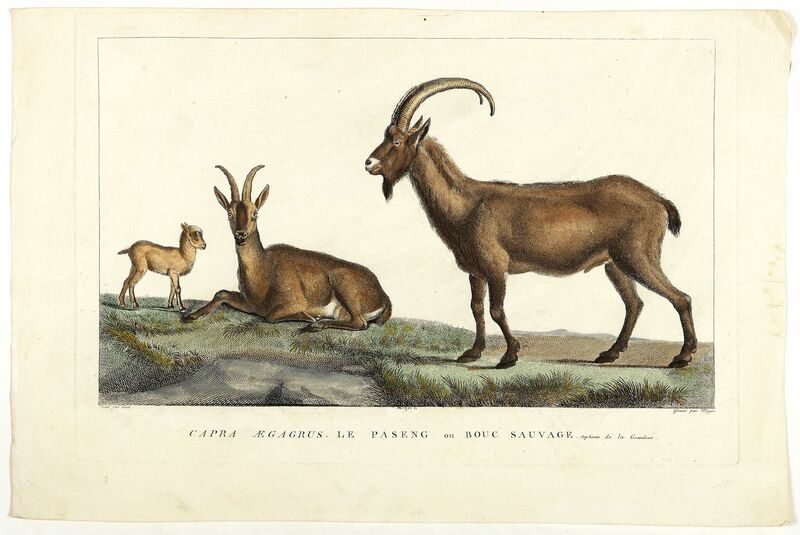 Very rare first state mezzotint. Proof before letters of the ‘Birch Heads’ before sitters name was engraved in the oval border. 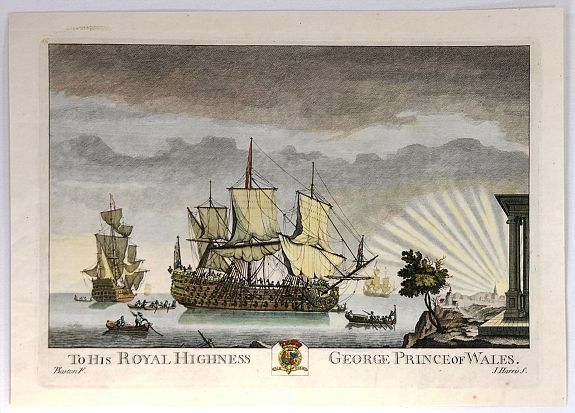 From Thomas Birch's "The Heads of Illustrious Persons of Great Britain". LE PELERIN - Jeu de l'Oie, renouvelé des Grecs, Jeu de plaisir et de récréation. Epinal, ca. 1850, In original pochoir colours.. 400x445mm. Wood block print with letter press in pochoir colours. Upper right corner missing, filled with paper. Thin paper. Poor condition. 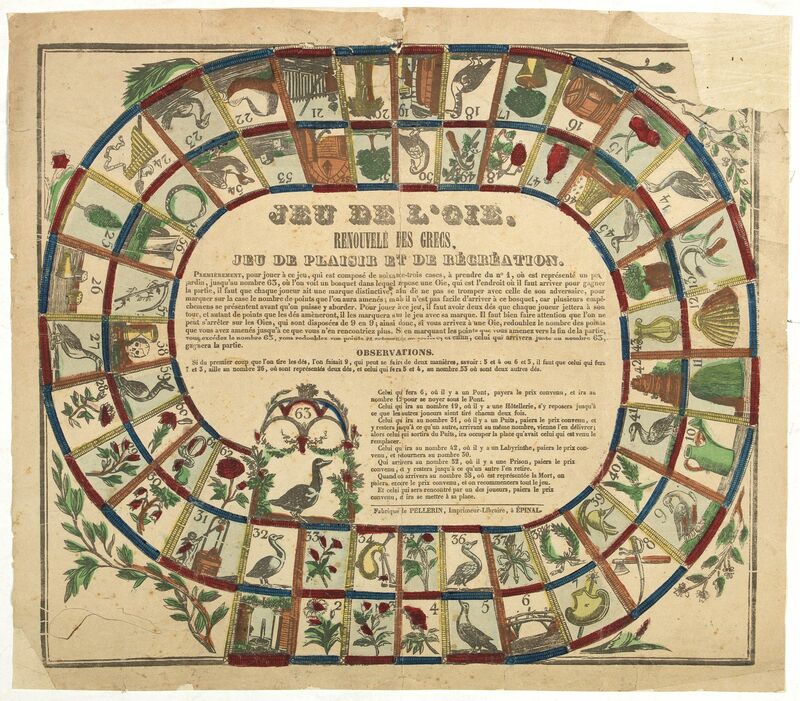 French Jeu de l'Oie (Game of the Goose) game board on thin paper with 63 numbered pictorial compartments, in the center, the rules of the game and the 63rd compartment, in which is a goose being crowned with laurels in a garden. MARCA STELLA. 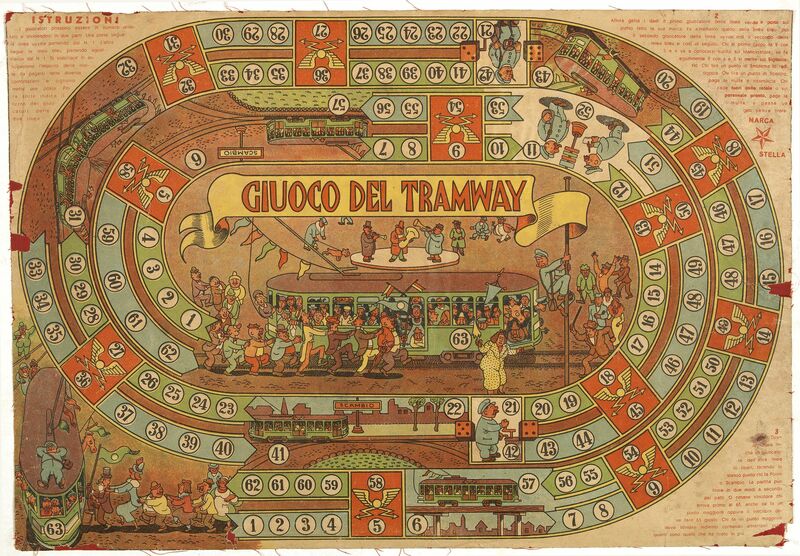 - Giuco Del Tramway. Italy, ca. 1960, In printed colours.. 325x470mm. Colour printed, linen-backed. Some missing parts. Else in good condition. 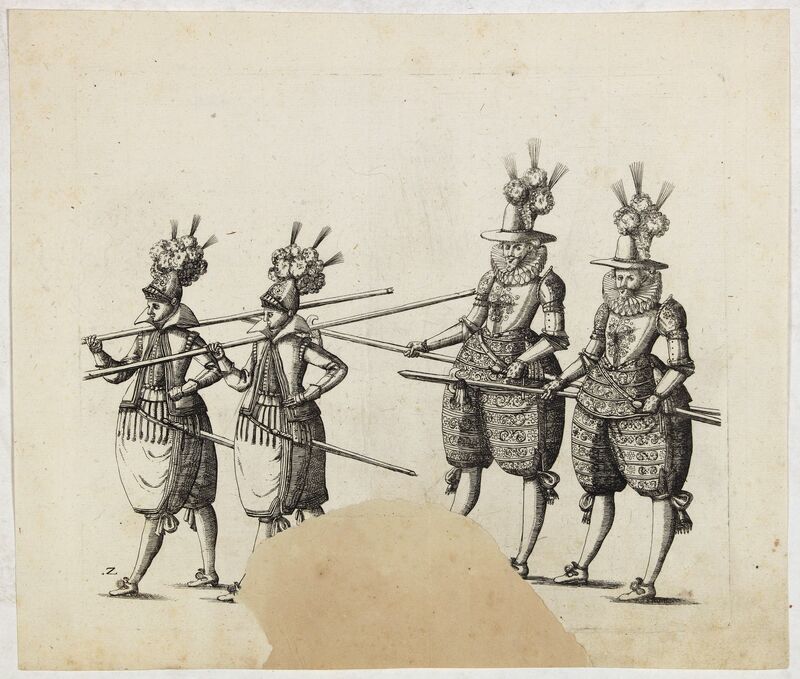 MERIAN, M. - Aufzug des durchleuchtigsten hochgebornen Fürsten und Herren, Herren Friderichen Pfaltzgrafen bey Rhein.. .
Hulsen, Stuttgart, 1616, Uncoloured.. 185x218mm. Part of the engraving missing. Good margins. Dark impression. 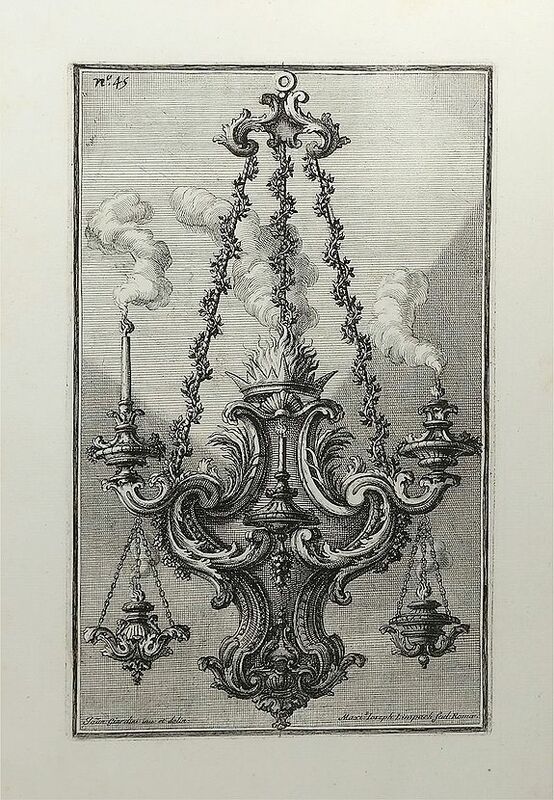 Paris, ca 1730, Uncoloured.. 295x430mm. In good condition, with a centrefold, a few small blemishes and holes to centrefold. Lightly age toned. Dark impression, wide margins. A detailed engraved view of the interior of the synagogue from Calmet’s renowned work. With a numbered key beneath. Hulsen, Stuttgart, 1616, Uncoloured.. 185x218mm. Paper slightly spotted and age toned. Good margins. Dark impression. WALTNER, Ch. - Le Lapin. Paris, Uncoloured.. 168x143mm. In good condition. Text on verso. 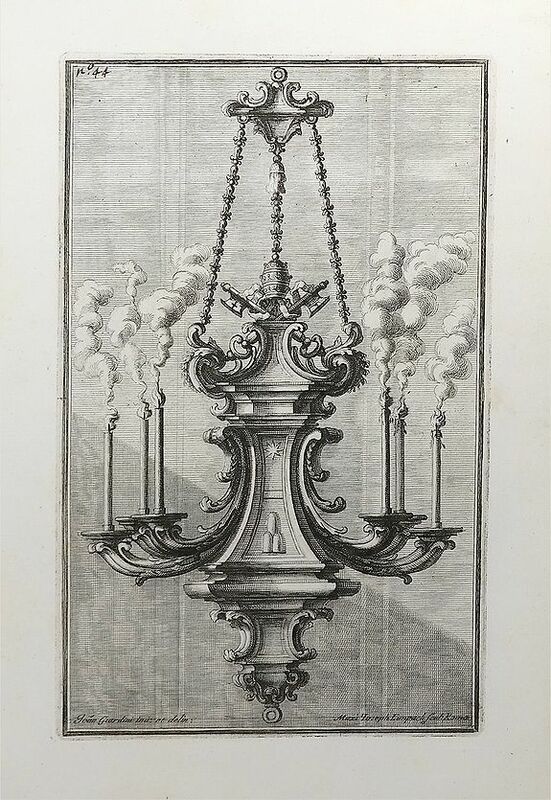 ZOCCHI, G. - Veduta del Ponte a S. Trinita, della Chiesa di S. Trinita e della colonna inalzata da Cosimo I.
Florence, Bouchard, 1754, Uncoloured.. 515x709mm. Very good to mint condition. Dark impression on thick paper. 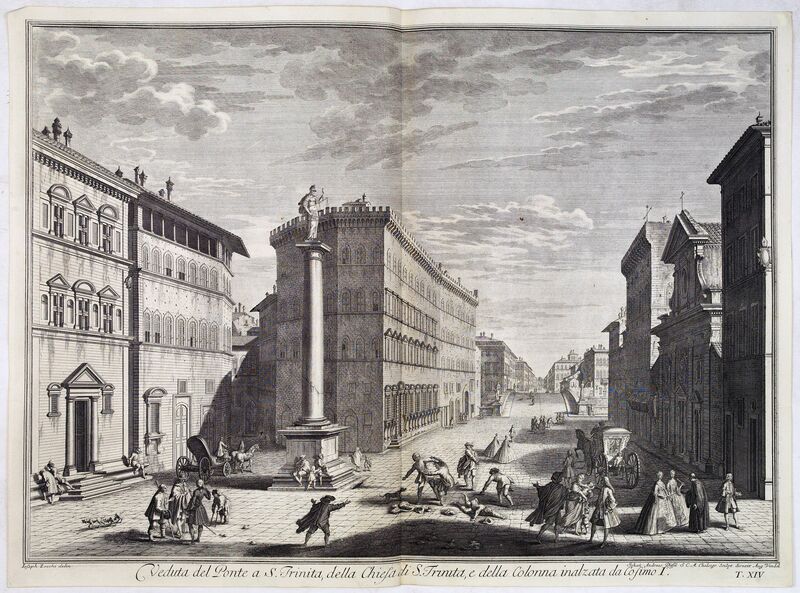 Lively street scene with the S.Trinita bridge in Florence after Giuseppe Zocchi (1711or 1717 - 1767) and engraved by Johan Andreas Pfeffel (1674-1748). 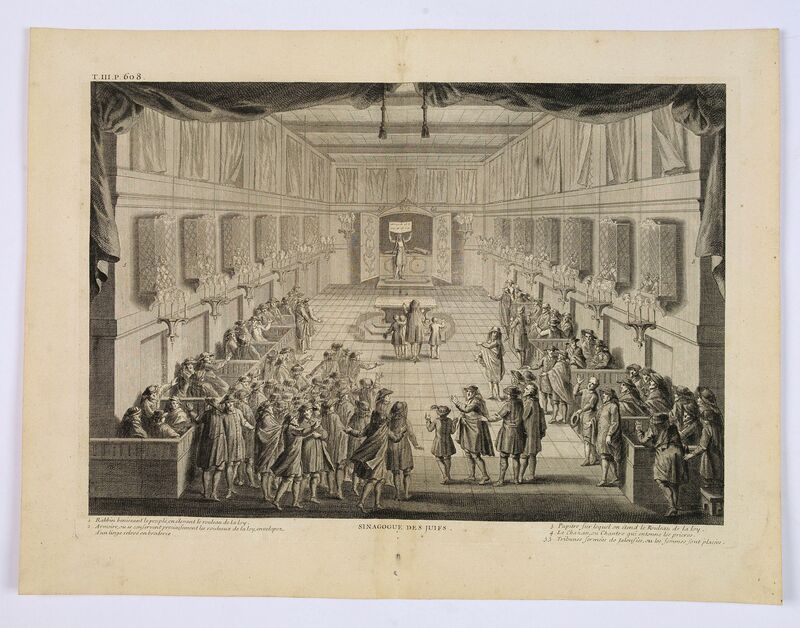 From "Scelta di XXIV Vedute delle principali contrade, piazze, chiese, e palazzi della Città di Firenze". London, c1720, Coloured. 215x305mm. In fine condition on hand-made, chain-linked, water-marked paper. London, 1850, In original colouring.. 210x350mm. Good bright condition wide margins. BASIRE, J. 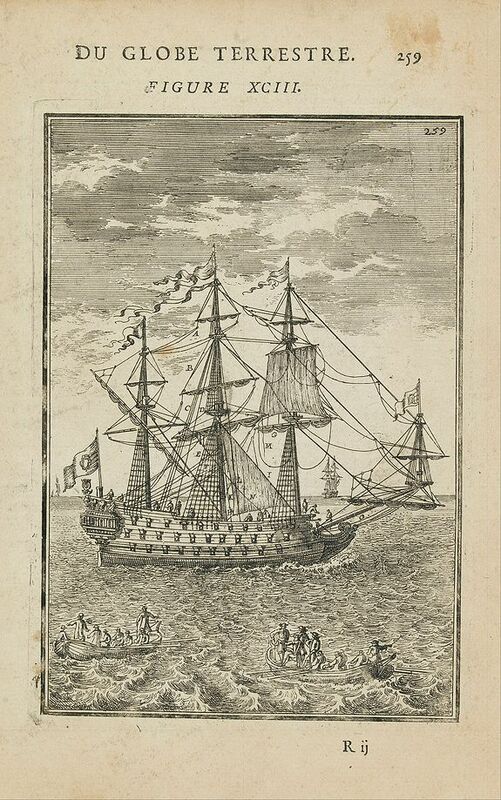 - The Ship Harry Grace a Dieu, from an Original Drawing preserved in the Pepysian Library in Magdalen College Cambridge. London, 1784, Uncoloured.. 220x300mm. 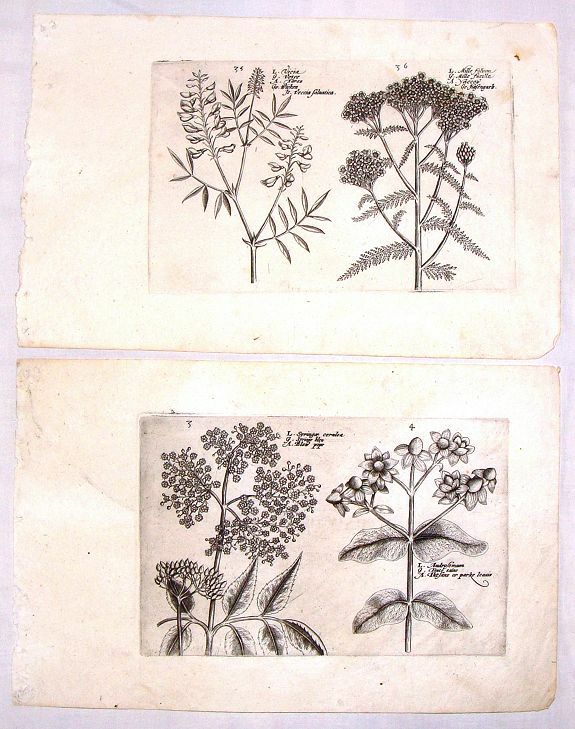 Good impression on hand-laid paper with large watermark. Wide margins on the sides - narrow margins on top. Vertical folds with creasing. Light browning. CHATELAIN, H. - Nouvelle Carte pour conduire a la Connoissance de la Marine . . .
Amsterdam, 1720, Coloured.. 490x580mm. In good condition, with a small repaired marginal tear in upper margin. 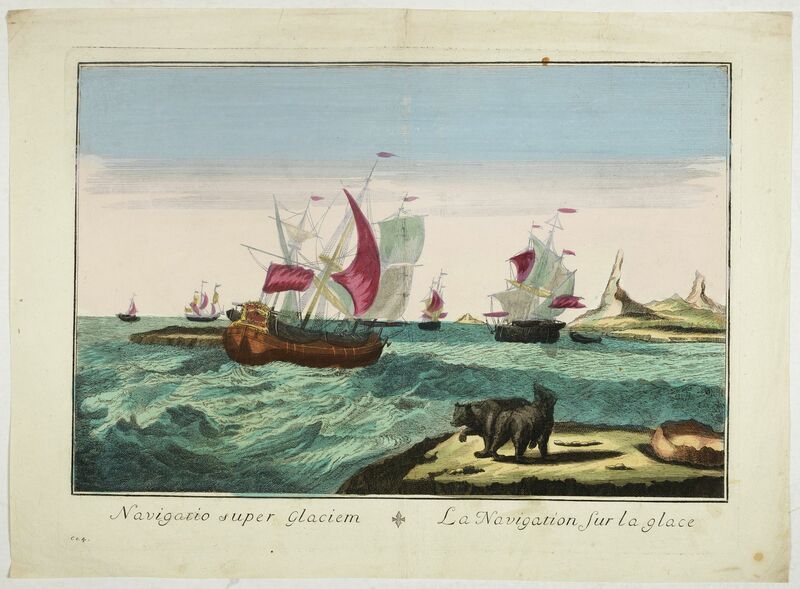 ANONYMOUS - Navigacio super Glaciem / La navigation sur la glace. Italy, c. 1780, In original colours.. 275x405mm. Paper age-toned with some marginal spots and on the edges of engraved area. Else in good condition. 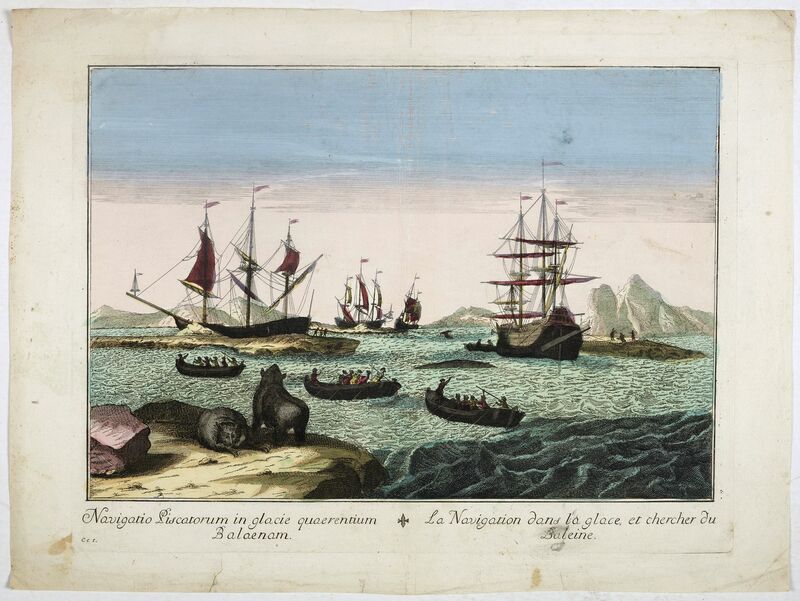 A so called optical print of the Greenland Whale Fishery with polar bears in foreground. Bilingual title in Latin and French. 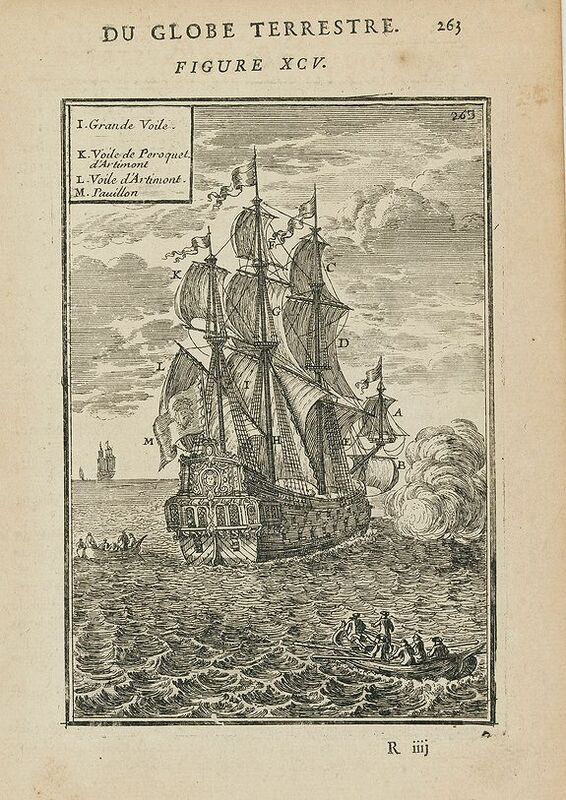 ANONYMOUS - Balaena ramis adigitur ad Navim / La baleine est rame en Navire. 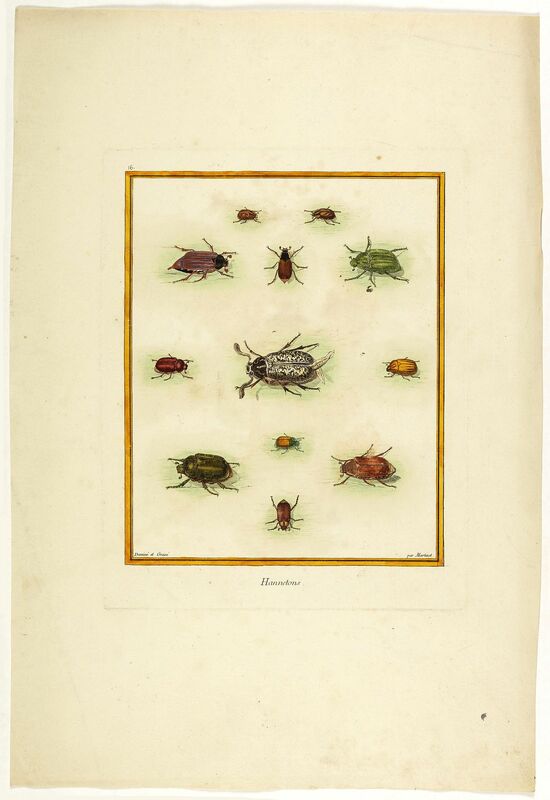 Italy, c. 1780, In original colours.. 280x410mm. Paper age-toned with some marginal spots and on the edges of engraved area. Else in good condition. 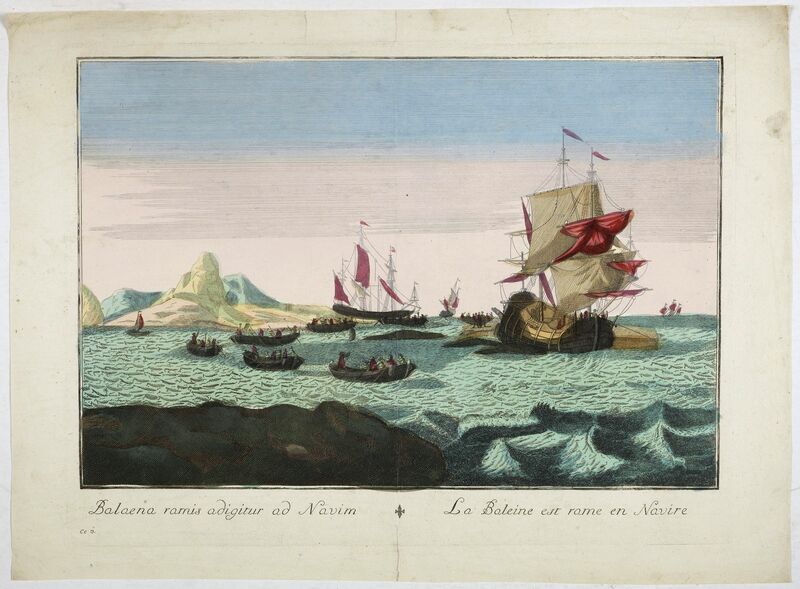 ANONYMOUS - Navigatio Piscatorum in glacie quaerentium Balaenam / La navigation dans la glace, et chercher du Baleine. Italy, c. 1780, In original colours.. 280x405mm. Paper age-toned with some marginal spots and on the edges of engraved area. Else in good condition. 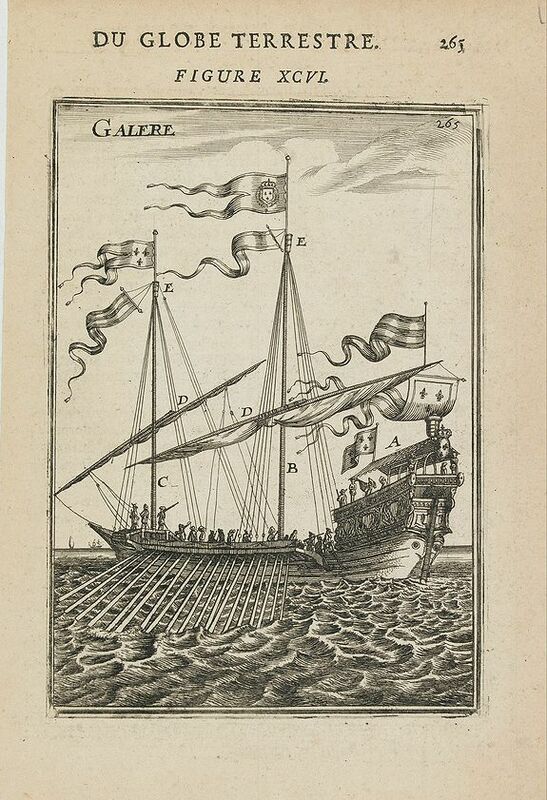 CHATELAIN, H. - Carte des pavillons accompagnée d'observations pour en faire comprendre le blazon et les différentes devises aussy bien que d'une table alphabétique pour les trouver facilement.? Amsterdam, 1720, Coloured.. 489x585mm. Very good impression. Paper slightly washed and some reinforcement on verso of foldings. 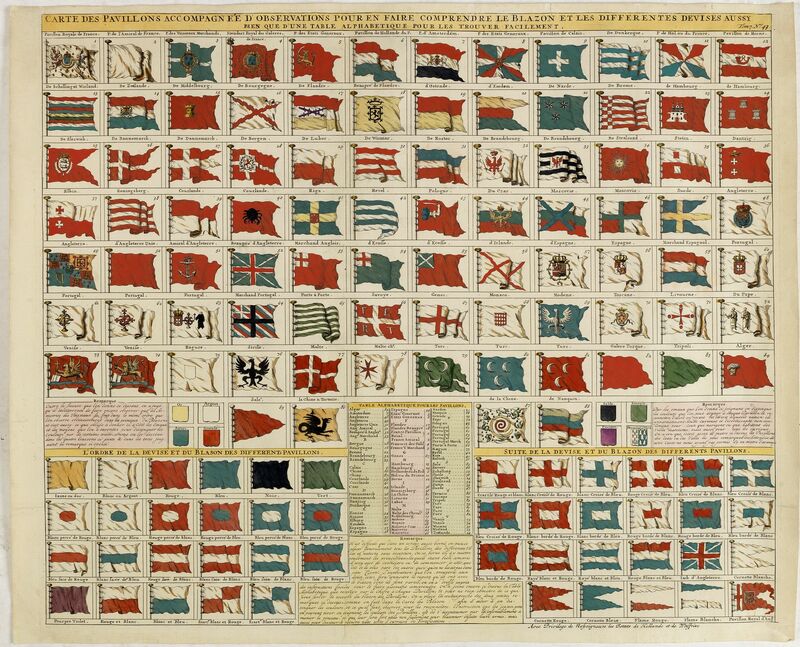 Plate of 88 marine flags, including Malta, Turkey, Middelburg, Amsterdam, Portugal, Monaco, Tuscany, China, Nanking, the French Royal flag, French admiralty flag and merchant flags. Paris, 1683, Uncoloured.. 143x100mm. Paper age toned. Else good condition. Paris, 1683, Uncoloured.. 147x101mm. Paper age toned. Else good condition. 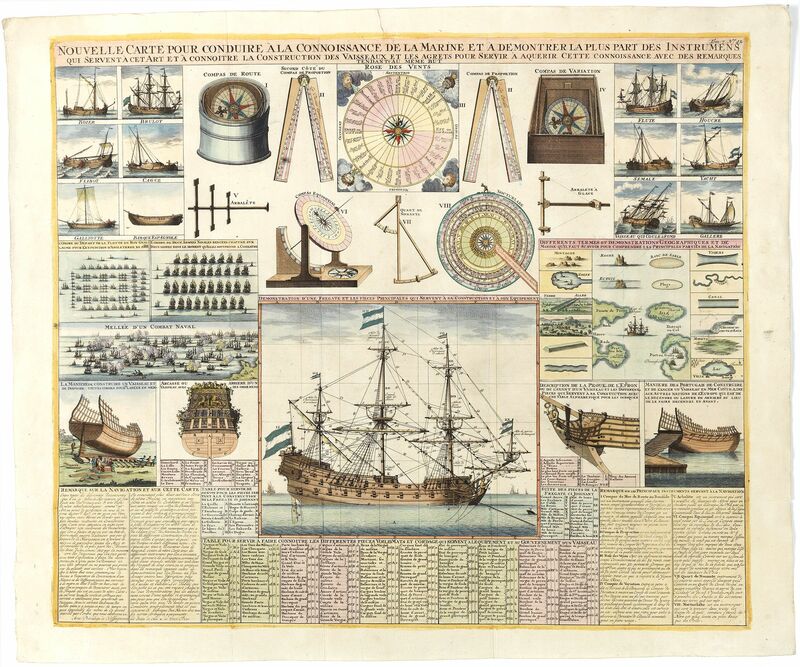 Miniature view of a vessel, showing the various types of sails. With key list in upper left corner. Paris, 1683, Uncoloured.. 148x103mm. Some age toning of paper. Some minor marginal age toning. Overall good condition. Finely etched depiction of a vessel, with a lettered key. With explanatory text on verso. Paris, 1683, Uncoloured.. 144x102mm. Some age toning of paper. Brown spot on lower margin. Trace of water stain on right margin. Overall good condition. 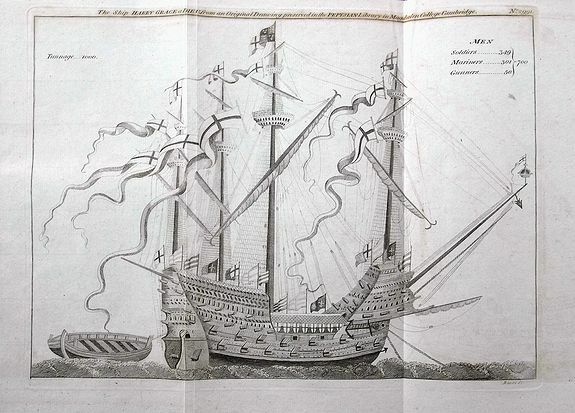 Miniature view of a vessel, showing its various corposants. With key list on verso. Amsterdam, 1614, Uncoloured.. 295x190mm. In fine condition. 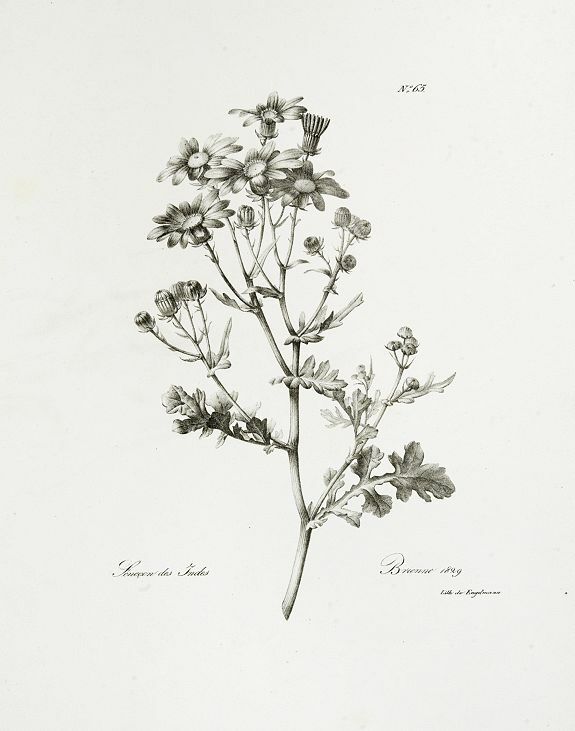 "HORTUS FLORIDUS" is deemed to be the most celebrated and influential of the early Florilegia (Blunt). 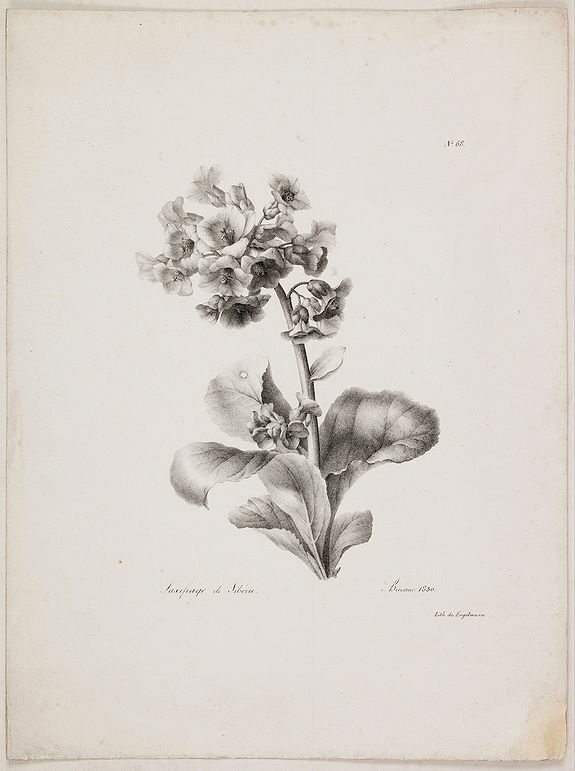 It inspired and predated a wide array of noted botanical artists, such as Hill, DeBry, Besler, and Sweert. 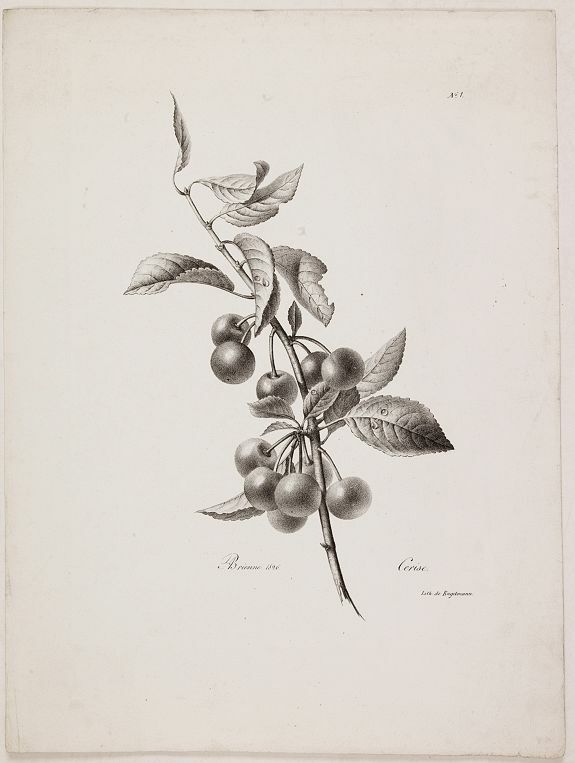 CHATELAIN, H. - Description, figure et qualité de l'arbre, du café, avec la manière de le cultiver et d'en cueillir le fruit. Amsterdam, 1720, Uncoloured.. 366x430mm. Very good impression. 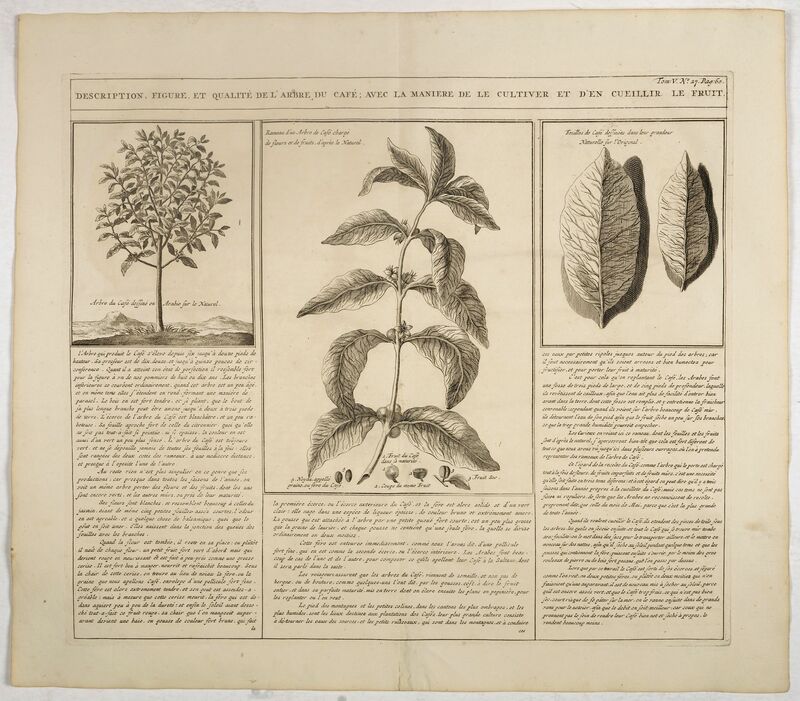 Decorative copperplate engraving showing a coffee tree, plant and fruit, with an lengthy description about its growing process. 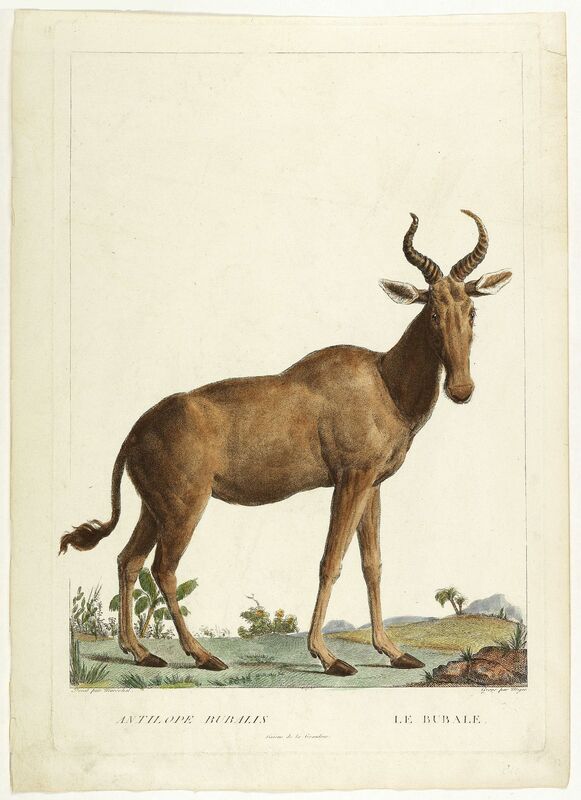 From Chatelain's monumental 7 volume "Atlas Historique". 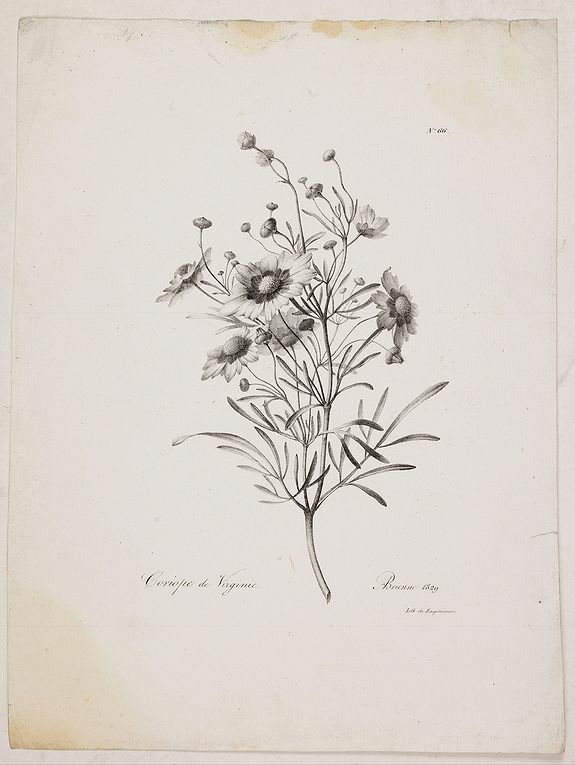 ENGELMANN, G. - Coriope de Virginie. N° 66. Paris, 1830, Uncoloured.. 250x140mm. Lithography on thick paper. In very good and dark impression. Some light marginal discolouration. ENGELMANN, G. - Cerise. 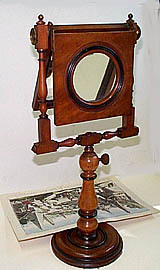 N° 1. Paris, after 1829, Uncoloured.. 150x210mm. In very good and dark impression. Paper size 355 x 260mm. ENGELMANN, G. - Saxifiage de Sibérie. N° 68. Paris after 1829, Uncoloured.. 150x210mm. Water stain lower right corner. Else very good and dark impression. Paper size 355 x 260mm. 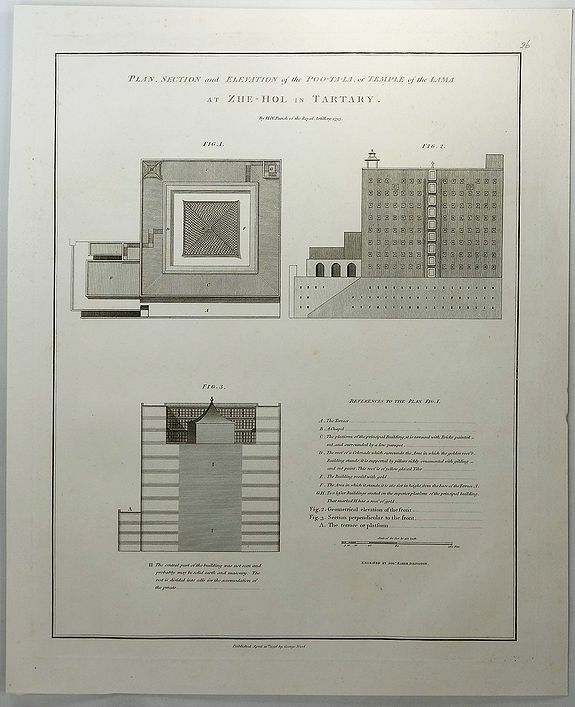 Fine lithograph by Godefroy Engelmann" after a drawing by Auguste Piquet de Brienne (1789-c.1860) . 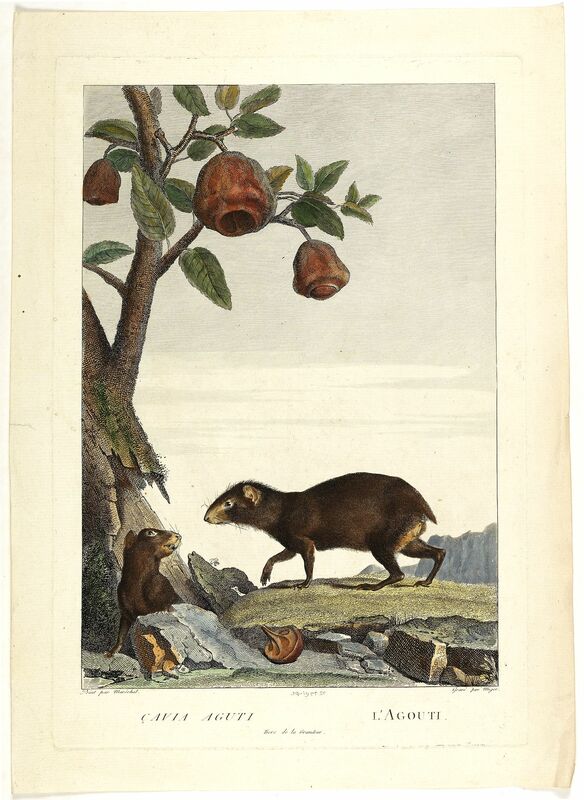 Published in Paris at rue Montmartre 6, after 1829 Godefroy Engelmann was born in 1788 in Mühlhausen, a small town near the France/Switzerland/Germany border. He died in that same town in1839. 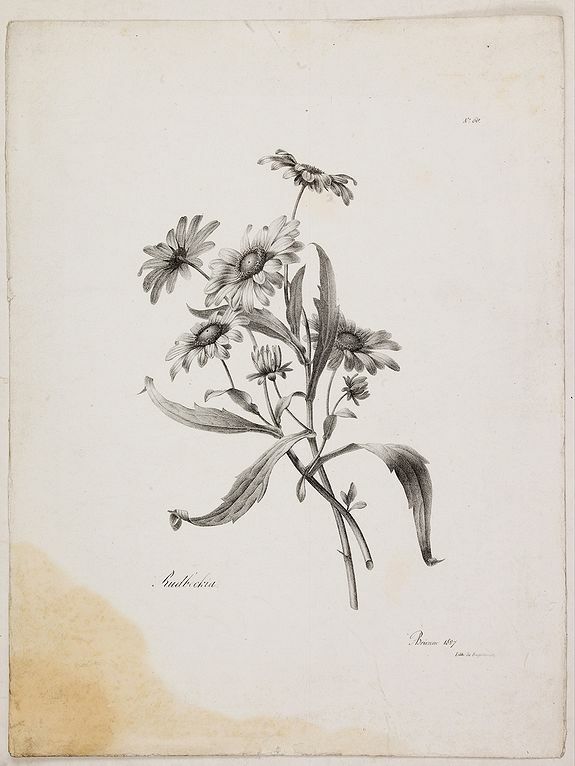 ENGELMANN, G. - Rudbeckia. N° 60. Paris, after 1829, Uncoloured.. 240x170mm. Large stain lower left corner not affecting printed area. Else a good and dark impression. Paper size 355 x 260mm. 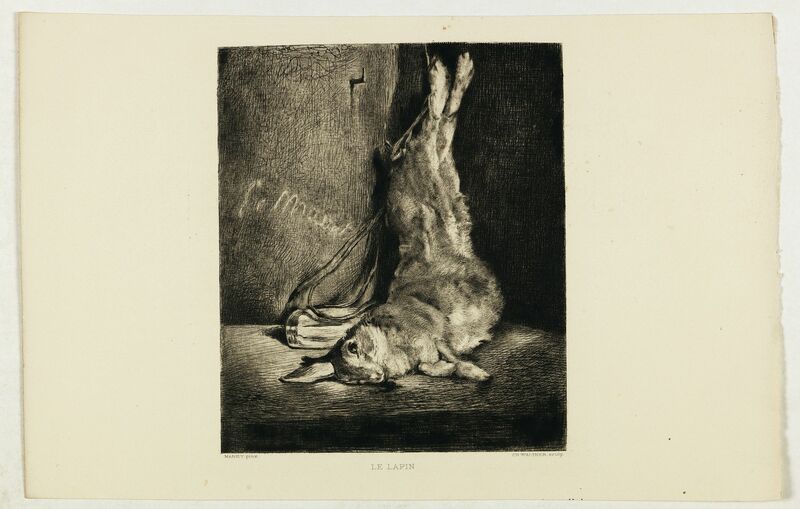 Lithograph by Godefroy Engelmann" after a drawing by A. Brienne. Godefroy Engelmann was born in 1788 in Mühlhausen, a small town near the France/Switzerland/Germany border. He died in that same town in1839. ENGELMANN, G. - Séneçon des Indes. N° 65. Paris, 1830, Uncoloured.. 240x170mm. A very good and dark impression. WILSON, Alexander. 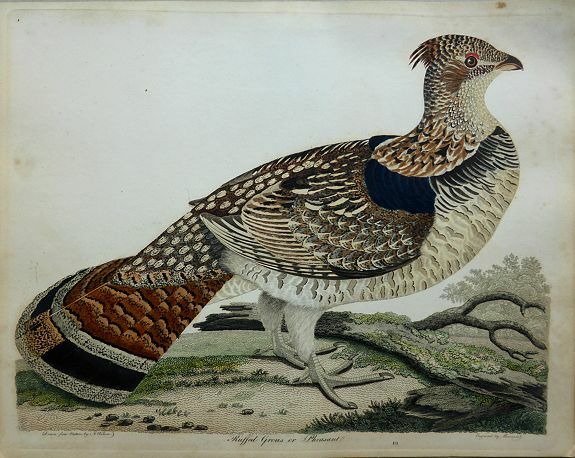 - Ruffed Grous or Pheasant Plate no. 49. Drawn from Nature by A. Wilson. 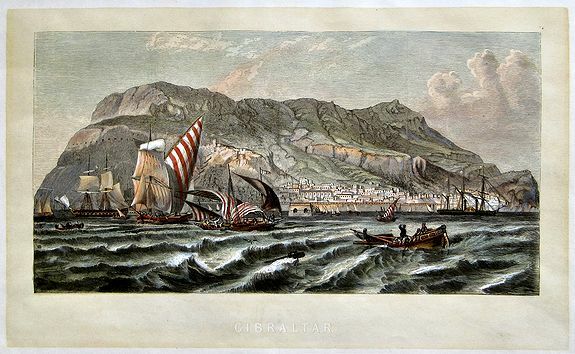 Engraved by J.G.Warnicke. - First edition. 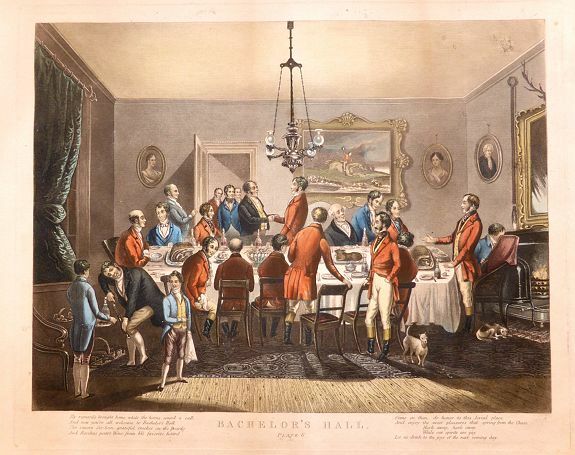 Philadelphia, 1808, Original hand colouring. 270x345mm. In very good condition with good size margins. The sheet measures 375 x 295 mm. 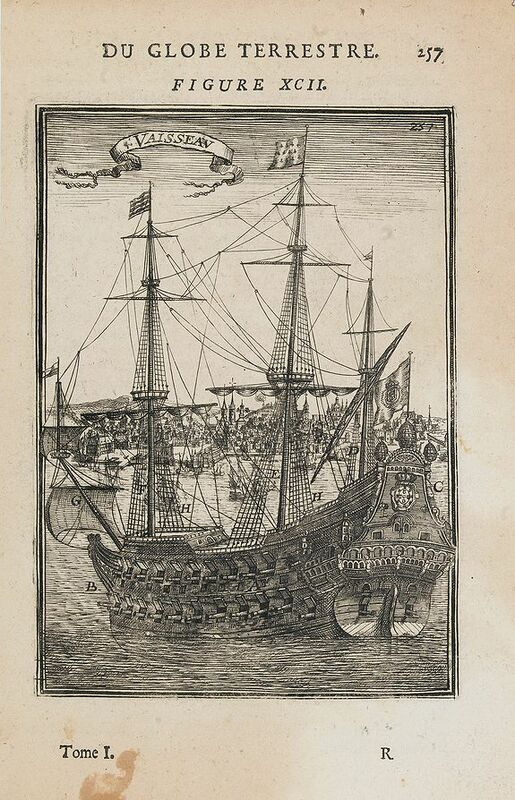 An American engraving published in Philadelphia by Blandsford and Inskeep dated 1808, it is a first edition, plate number 49. Paris, 1808, Coloured.. 335x203mm. In good condition. Paris, 1808, Coloured.. 245x375mm. Paper slightly age toned, but generally in good condition. Paris, 1808, Coloured.. 245x185mm. In good condition. Paris, 1808, Coloured.. 380x255mm. In good condition. On tick paper. ALEXANDER, W. - Plan, Section and Elevation of the Poo-Ta-La or Temple of the Lama at Zhe-Hol in Tartary. London, 1796, Uncolored. 365x285mm. In very fine condition. 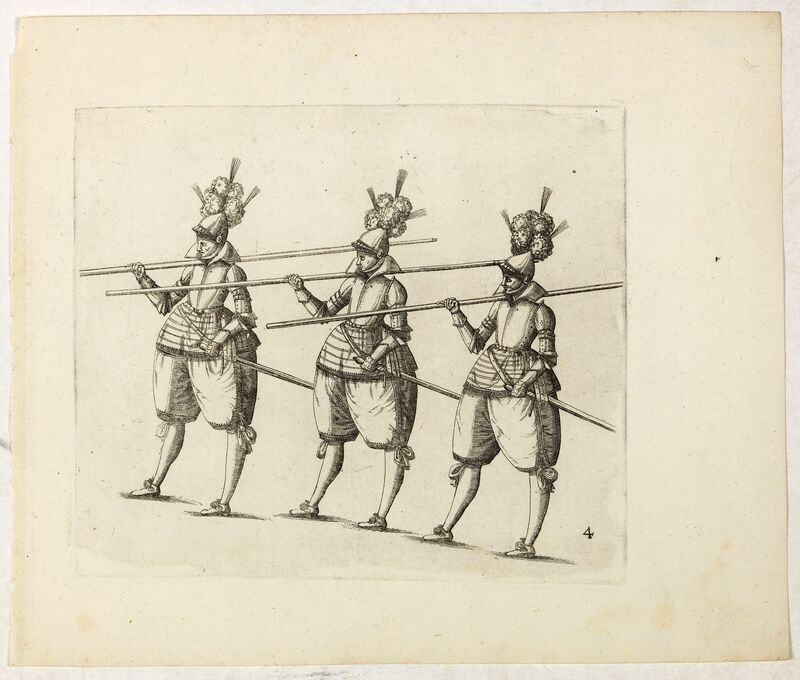 A striking copper engraving from an important eighteenth century series on China by William Alexander. From Sir George Leonard Staunton's An Authentic Account of an Embassy from the King of Great Britain to the Emperor of China, published by George Nicol in London in 1796. GIARDINI, G. - [Design Art] Italian Figural Side Table. 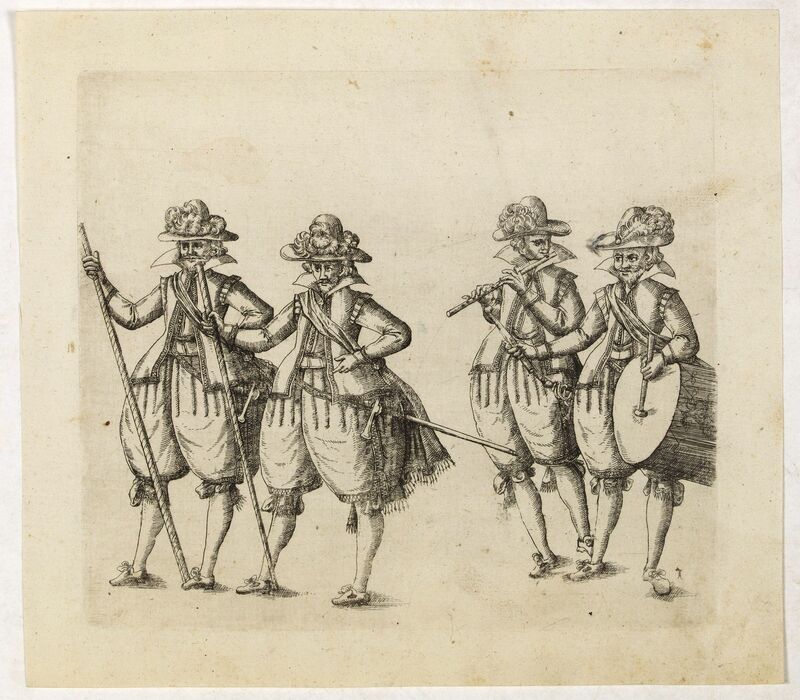 Prague, 1714, Uncolored. 180x280mm. In very fine condition. 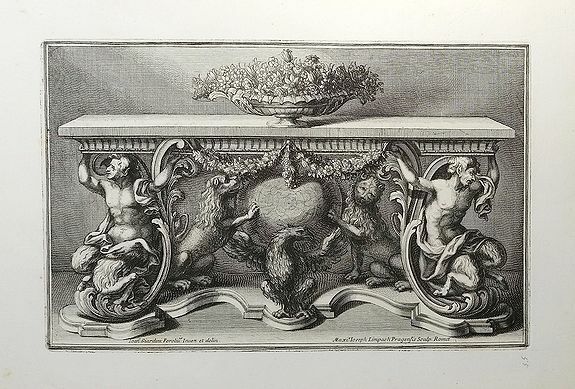 A fine copperplate of an Italian Side Table featuring two Bachus, two Lions and an eagle, from the finest 18th-century collection of secular and ecclesiastical designs for silversmiths and goldsmiths by Giovanni Giardini, a leading artisan in Rome. Prague, 1714, . 275x170mm. In fine condition with light foxing in the margin. 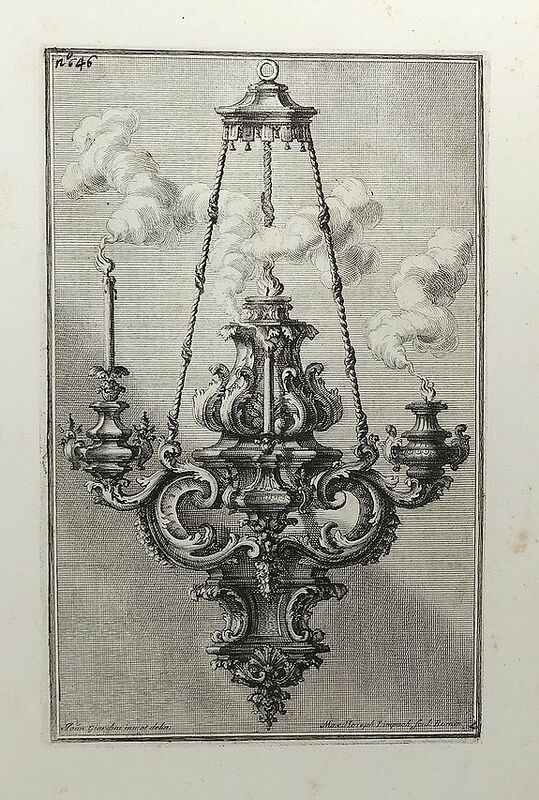 A fine copperplate of an Italian Chandelier from the finest 18th-century collection of secular and ecclesiastical designs for silversmiths and goldsmiths by Giovanni Giardini, a leading artisan in Rome. Prague, 1714, Uncolored. 275x185mm. In very fine condition. Prague, 1714, Uncoloured.. 275x175mm. In very fine condition. Paris, ca. 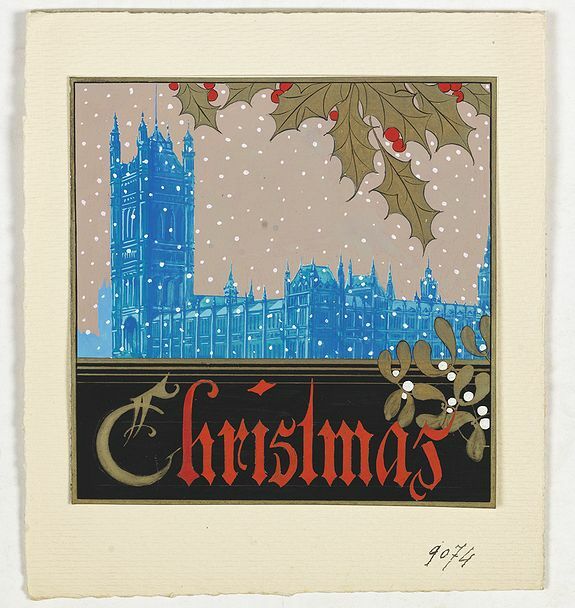 1930, In attractive strong original colours.. 135x135mm. Original gouache fixed on a larger sheet (185 x 165 mm) with number 9074 in black ink in lower margin. In excellent condition and well preserved because of the protective sleeve. Outstanding "art deco" gouache (unsigned) from the workshop of "Robert Pichon. Ateliers de Dessin et Lithographie – 10, rue Rochechouart – Paris. Paris, ca. 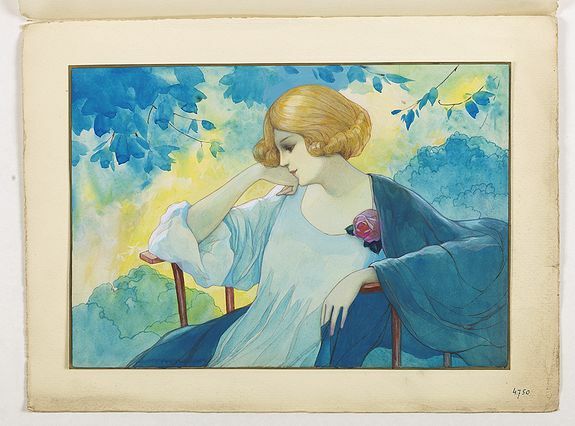 1930, In attractive strong original colours.. 90x143mm. Original gouache fixed on a larger sheet (145 x 213 mm) with number 9080 in black ink in lower margin. 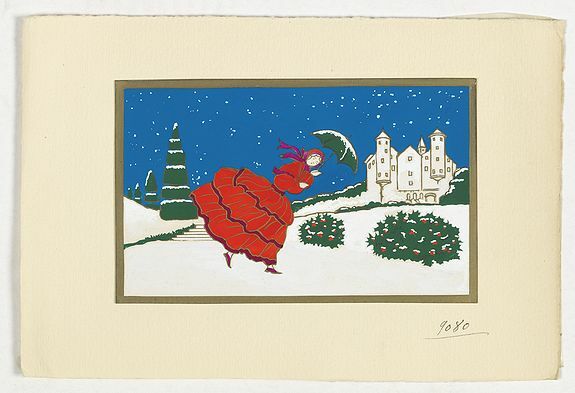 The gouache depict a scene of a woman walking in the night in a snowy park. Colours are bright and fresh. PICHON, R. (Workshop). - "Art déco" gouache. Paris, ca. 1930, In attractive strong original colours.. 90x143mm. Original gouache fixed on a larger sheet (140 x 210 mm) with number 9081 in black ink in lower margin. 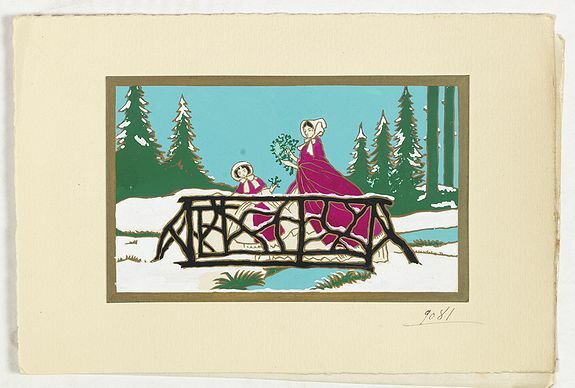 The gouache depict a scene of a woman and a little girl in a snowy landscape. Colours are bright and fresh. Paris, ca. 1930, In attractive strong original colours.. 98x140mm. Original gouache fixed on a larger sheet (165 x 200 mm) with number 9079 in black ink in lower margin. 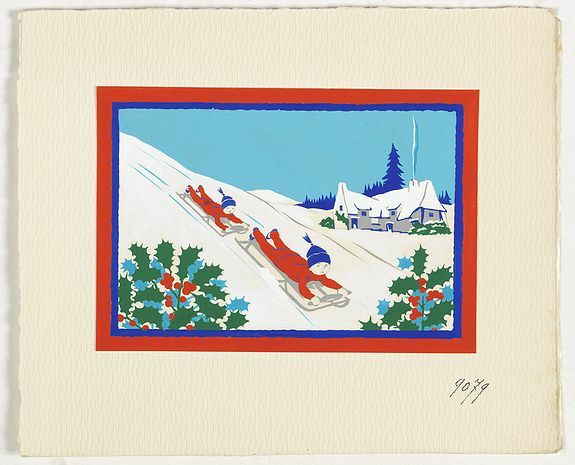 The gouache depict a scene of two kids sledding. Colours are bright and fresh. Paris, ca. 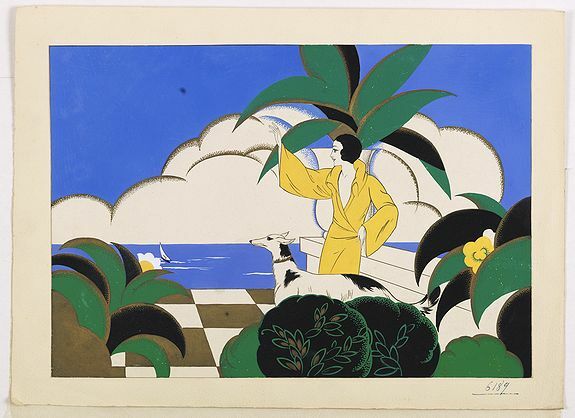 1930, In attractive strong original colours.. 225x325mm. Original gouache fixed on a larger sheet (270 x 375 mm) with number 6189 in black ink in lower margin. Paris, ca. 1930, In attractive strong original colours.. 230x330mm. Original gouache fixed on a larger sheet (290 x 395 mm) with number 6626 in black ink in lower margin. Paris, ca. 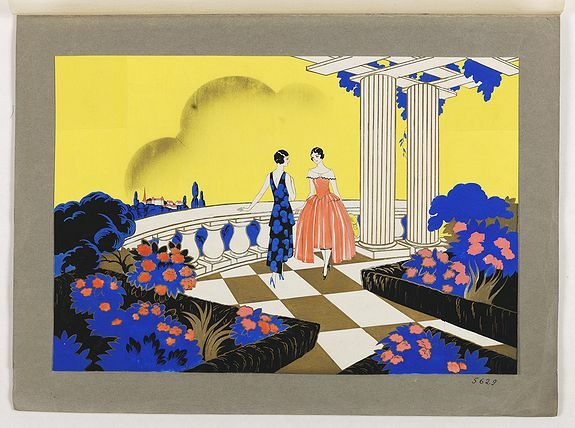 1930, In attractive strong original colours.. 225x325mm. Original gouache fixed on a larger sheet (290 x 395 mm) with number 4750 in black ink in lower margin. The gouache depict a scene of an elegant woman in a garden. Colours are bright and fresh. Paris, ca. 1930, In attractive strong original colours.. 230x330mm. Original gouache fixed on a larger sheet (280 x 375 mm) with number 5629 in black ink in lower margin. 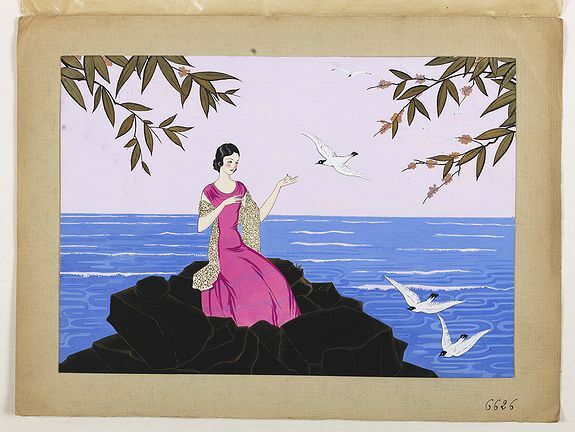 The gouache depict a scene of Elegant women in an exquisite garden in Japanese style. Colours are bright and fresh. Paris, ca. 1930, In attractive strong original colours.. 220x320mm. Original gouache fixed on a larger sheet (290 x 390 mm) with number 6625 in black ink in lower margin. 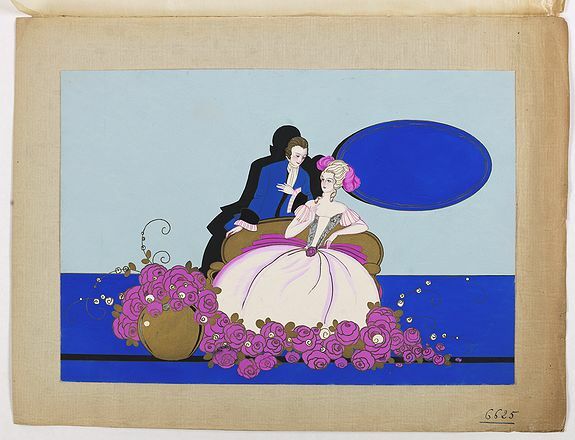 The gouache depict a scene of an elegant woman and a claimant. Colours are bright and fresh.